Holders – tissue elements of the interior, gathering the curtains on the sides of the window without movement along the eaves. 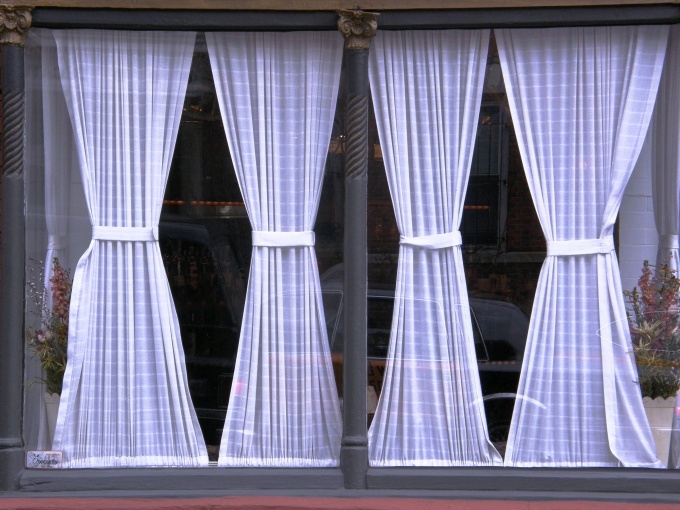 With the help of these decorative and functional holders are created of fine draping. If you show taste and imagination, a simple cloth tape will turn into a stylish interior accessory. The newcomer is easier to sew the tie backs on curtains of plain rectangular strips. Start preparation of holders for curtains with the careful selection of materials. It is recommended to use thick fabric or light fabric combined with a thick lining. If you want to make a part with a large pattern, choose a fabric that allows you to position it symmetrically on two grabs. Wrap a tissue sample for sewing the tie backs around the curtains and evaluate its appearance. If the material is suitable, make a pattern. According to the standards, the holder for the curtains, make a 10 cm wide and 30-40 cm in length. Adjust its size individually by moving the segment in the window and trying a variety of drapery from simple bends to the lush folds. Make a pattern of four items for future holders of the basic material with the seam,1-1. 5 cm you Can simplify your task by making 2 rectangle and fold each in half. If necessary, take two linings without allowances. Ssuite grabs one of the following:1) Put the lining on wrong side of the halves of the wings and sew it invisible stitches on the fold line of the seam. Prostrochite the details of the wings, leaving one part open. Tutuila seams and remove the finished product is obvious. Baste the open side of the seam.2) Fold a rectangular pattern in half and fold allowances inwards otladiv the wings on the edge of the hem. At seams sew decorative braid or bake; treat it as the opposite edge of the holder. You can do without additional accessories, if you handle the edge sturdy decorative stitching. Make a closure button or rivet on the ends of the holders. For better fixation of curtains on the opposite side of the walls, attach special metal hooks for grabs. Choose them in the shops of sewing accessories from the various options: for example, chrome or wood; in various shapes, which can be important interior accent. Make decorative holders in different ways. Often sheathe fabric with two rings (you can cut them out even from an empty plastic bottle with a large diameter). It is interesting to look holders, woven from solid-colored or multi-colored strips of cloth. Holders for curtains knitting needles or crochet; make a lush ribbons; is decorated with applique and plush figures. Luxury curtains and tie backs on them are even decorated with rhinestones and Swarovski pendants, attached to the wall holders made of glass or crystal.